Adaptor kit that will allow mounting of EVO VIII-IX 75 MM throttle body to the aftermarket intake manifolds with Infiniti Q45 bolt pattern. Kit includes adaptor plate, gasket and all required hardware. 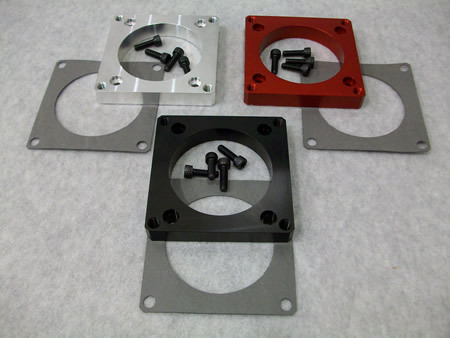 Adaptor plate is CNC machined out of billet aluminum and is available in natural aluminum, red and black anodized finishes.